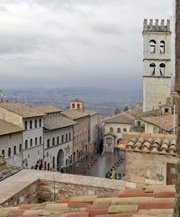 This walk begins in Piazza del Comune (illustrated above), which stands on one of the Roman terraces that runs along the hillside from west to east. This central terrace was probably built in the 2nd century BC as the forum of Asisium. The original pavement, some 5 meters below the current street level, was laid in ca. 25 AD: it can be explored in the Archeological Area that now forms part of Museo Civico (see below). The so-called Temple of Minerva, which still dominates the north side of the piazza (i.e. the right side in the illustration above), is now at street level but it stands on a second terrace that was some 5 meters above the forum. This model shows the entrances to the two flights of steps steps that led to its pronaus and the tetrastyle that stood in the forum in front of it. The base of this tetrastyle still survives in situ in the Archeological Area, and an inscription on it reveals that it housed statues of Castor and Pollux. ✴the tetrastyle (in front of the palace opposite the temple). The ex-temple now houses the church of Santa Maria sopra Minerva. The piazza was known as the Platea Mercati (market square) by 1093. Many of the palaces that then adorned it were torn down during the popular uprising of 1198. From 1212, when the church of San Donato (which had been installed in the temple) was transferred to the Commune, the piazza became known as the Platea Comunis (the seat of the municipal government). Further demolitions carried out in 1228 (perhaps to make way for the crowds expected for the canonisation of St Francis) and in 1274 allowed the opening up of the piazza to the west. The Torre del Popolo was built next to the temple, with the Palazzo del Capitano del Popolo beyond it. (Both are described in the page on Public Palaces). ✴the Palazzo del Governatore, to the right of them, which is pierced by the recently-restored Volta Pinta. (All are described in the page on Public Palaces). The Arco dei Priori, to the right of the first of the Palazzi dei Priori (which is recognisable by the crenellations that were added in 1926) marked the eastern end of the forum: all the palaces to the right of it, including Palazzo Bonacquisti at number 6, stand above it. The remains of the terrace wall that sustained the forum can be seen in Via Macelli Vecchi, which runs behind them. The Roman paving under them has recently been incorporated into the Archeological Area and adapted to provide new exhibition space in Museo Civico (see below). What was the side wall of the ex-church of San Nicolò (now the ex-Palazzo delle Poste) closes the piazza to the west. The Tabernacle of the Madonna del Popolo to the left is described in the page on San Nicolò. Via Portica (to the left of the tabernacle) rests on the pavement of the Roman forum behind a portico of three arches. The pulpit (1354) above the right arch, which is documented as the work of Nicolò da Bettona, came from the Palazzo del Governatore. The door beyond the portico leads to the surviving crypt of San Nicolò, which was adapted in the 1930s to house the Museo Civico and to provide an entrance to the Archaeological Area. (There is now a second entrance from Via Arco del Priori - see Walk II). Walk to the Fonte di Piazza at the other end of the piazza. ✴The street sign also gives the old name, Via del Ceppo della Catena: ceppi are shackles, and this must mean the ring that secured the chain (catena) that was placed across the street at night time. ✴The sign to the right of it, which is dated 1542, marks the boundary of the Terziero di Santa Maria (one of the three new administrative districts created in that year). Return to the fountain and leave the piazza by Via San Rufino, to the left of it. Cardinal Antonio Barberini founded the Monte Frumentario at what is now number 10 Via San Rufino in 1633. The architrave of the door has a relief of a bee (the symbol of the Barberini) at each corner. (The establishment moved to Via San Francesco in 1746 - see Walk III). Via del Pozzo della Mensa, the road to the right here, used to lead to the well of this name in the Casa dei Canonici (see below). Continue along Via San Rufino into Piazza di San Rufino. A stretch of a Roman road paved in pink stone has recently been excavated at the entrance to the piazza. This road lead towards the presumed site of the acropolis of Assisi, later the site of the Rocca Maggiore, and it could have been a “via sacra” (sacred way). Piazza San Rufino is, of course, named for San Rufino, the Duomo of Assisi, which dominates it. The piazza stands on a second Roman terrace, the retaining wall of which runs along the left side of the church and forms part of its foundations. The Casa dei Canonici, which used to belong to the canons of San Rufino, is on the right. It now houses the Museo Diocesano. Via del Pozzo della Mensa, which you came across earlier in the walk, is named for the well in the canons’ cloister, which now forms part of the museum. The house on the left, next to the façade of San Rufino, is reputed to have belonged to Favarone di Offreduccio, the father of St Clare. The Fontana di San Rufino is in the façade of the adjacent Palazzo Sermatti (late 18th century) at number 6. This palace was built for Count Filippo della Genga (the brother of Pope Leo XII) soon after his marriage in 1793 to Marianna Sermattei of Assisi. Their son, Cardinal Gabriele della Genga Sermattei, was born here in 1801. ✴Walk a little way along Via Porta Perlici, to the left of the fountain. The house at number 9 on the left was once the hospital of the Confraternita di San Lorenzo. ✴Walk a little way along Via del Torrione, which runs along the left side of of San Rufino. The ruins of what is thought to have been the Roman theatre can be seen in the garden of number 3 on the left. This used to be the site of a marble cutter’s workshop, and there is evidenceof his art on the right. Retrace your steps: there is an interesting view of the Roman foundations of San Rufino and its campanile before the street along the side of Piazza San Rufino. Continue ahead along Via delle Rose, past Palazzo Agostini (17th century) on the right. The ex- Palazzo dei Consoli (12th century), which has two bifore windows in the top storey, is just beyond it at number 2c on the right. The Consuls moved to new premises in the Piazza del Comune in 1215, and the old palace was subsequently incorporated into the adjacent Monastero della Benedetta. Continue to the church of Santa Maria delle Rose on the right. This ex-church (to the right in the photograph) now houses an exhibition of modern works of art by Guido Dettoni della Grazia on the theme of the Virgin Mary. Take a detour by walking back a little way along Via delle Rose and turning right down the stepped Vicolo della Fortezza. The retaining wall on the right contains the remains of the aqueduct that Brother Giovanni da Penna built in 1238 to bring water to San Francesco. Return to Santa Maria delle Rose and turn right along the left side of the church and right again along Via Joergensen. This street is named for the Danish poet, Johannes Jørgensen, who wrote a biography of St Francis in 1907 and subsequently received honorary citizenship of Assisi. This street leads to the ex-Oratorio di San Lorenzo (later Villa Berkley). Turn left and walk around the garden of the villa to this junction with Via della Rocca. A detour to the left along Via della Rocca leads up to Rocca Maggiore. Retrace your steps to the junction and continue down Via della Rocca, with the garden of Villa Berkley now on your right. There is a lovely view of Rocca Minore (see below) ahead. Continue to the Arco Perlici on the right. The innermost arch of this double structure probably stands on the line of the Roman walls. There are interesting Roman remains in Hotel la Rocca, which is on the right, between the two arches. Take a short detour by turning right through both arches and along Via Porta Perlici, looking back to see what seem to be the Roman foundations of the inner arch. The ex-Oratorio di San Vitale is in a cul-de-sac on the right, just before number 19a. Retrace your steps through the two arches and turn right to continue along Via Porta Perlici. When the road swings to the right, fork right up the steps beside the remains of the aqueduct that Brother Giovanni da Penna built in 1238 to bring water to San Francesco. It is an extension of the Roman Sanguinone Aqueduct, which brought water from Colle San Rufino to the city and in particular to the amphitheatre (see below), which could be flooded for the re-enactment of naval battles. The Perugians used it for their entry into the city in 1494. Cross the busy Via Villamena and turn left to Porta Perlici. Stay inside the city walls and go up the steps to the right of the gate, which lead to the natural terrace above the site of the Roman amphitheatre. Continue along the terrace and then take the steps down to Via dell’ Anfiteatro. Fonte di Perlici is on the left. Retrace your steps along Via dell’ Anfiteatro and continue anti-clockwise. The remains of one of the radial walls of the amphitheatre can be seen in the garden of number 22a. Take the second turn on the right into Piazza Matteotti and turn left, leaving the piazza by Via Eremo delle Carceri, passing the ex-church and nunnery of Santa Caterina on the left (now Relais Nun). Recent excavations (completed in 2010) have brought to light remains from the amphitheatre here, and these are now incorporated into the hotel spa. Continue along Via Eremo delle Carceri to the Porta dei Cappuccini. The ex-church of Sant’ Antonio Abate is just before the gate, at number 22 on the right. Turn left along the unpaved road along the inside of the city wall, or alternatively along a similar but tree-lined path along the outside of the walls, to the Rocca Minore. It is possible to continue from end of this path to the Eremo delle Carceri, but this involves a strenuous hike of some 4 km and a climb of about 250 meters along a signed but rocky path. The hermitage can also be visited in the car journey described in “Around Assisi”. Retrace your steps past Santa Caterina to Piazza Matteotti. The terrace opposite Santa Caterina is a good point from which to take an overview of the piazza, and to enjoy the view of the Rocca Maggiore. This square was probably the site of a circus in Roman times, and of the market square of the medieval city. It now houses the bus station and an underground car park. ✴The boarding school known as the Convitto Nazionale di Assisi (1940), which dominates the long side of the piazza. According to Enrico Sciamanna (referenced below, at p. 139), the remains of a number of graves in a Roman necropolis that was in use for about 400 years from the 2nd century BC were found during the construction of the school and the subsequent construction of the nearby car park. A Roman inscription (CIL XI 5407, now in the Museo Civico), which was probably found here, seems to relate to the Roman mausoleum at the corner of Piazza Matteotti and Via Torrione (below). ✴The neo-Gothic Casa Assunti (1918-26) at number 5 on the far side of the piazza incorporates the remains of a monumental entrance to the city that had been discovered nearby shortly before the house was built. The huge base of a Roman column in its courtyard to the right of the tree in this photograph) was one of four that were discovered in nearby Vicolo Bovi at this time that probably came from a loggia that led from the city gate to the acropolis. ✴The remains of a Roman mausoleum can be seen further to the left, at the corner of Via del Torrione. ✴around the garden of San Rufino, with a fine view of its dome and its apse. A flight of steps then leads down to Via San Gabriele Addolorata. Turn right and continue to Piazza del Comune, where the walk ends.